Welcome to Spotlight! We will feature Dorsey Schools’ students, graduates, staff members, and others here from time to time to highlight their hard work and achievements. In today’s Spotlight, instead of talking about a single person, we would actually like to acquaint you with our Waterford-Pontiac, MI campus. 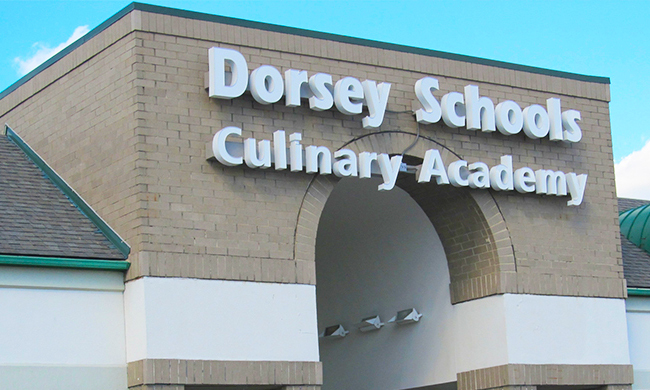 The Dorsey Schools Waterford-Pontiac, MI campus in conveniently located in northern Oakland County and has helped hundreds of men and women train for exciting new careers. What Training Programs are offered at the Dorsey Schools Waterford Pontiac MI campus? Where is the Dorsey Schools Waterford-Pontiac, MI campus located? The Waterford-Pontiac, MI campus is located at 440 N. Telegraph Road (which is close to the corner of Elizabeth Lake Road and N. Telegraph Road) in Pontiac, MI. Our campus is in the North Pointe Shopping Center, across the street from the old Summit Place Mall building. If you’re coming to visit us for the first time, you’ll want to enter through the main (allied health) entrance (not the culinary entrance). The allied health entrance is closest to Telegraph Road. Our school is also easily accessible by the bus line – SMART Bus 752 (Phoenix Center Bus) drops passengers off in the plaza where our school is located. Our campus has helped students throughout Oakland County pursue their career training. The Waterford-Pontiac, MI campus is close to nearby communities such as Pontiac, MI; Waterford, MI; Troy, MI; Rochester Hills, MI; Auburn Hills, MI; Clarkston, MI; Keego Harbor, MI; and more! What’s it like at the Waterford-Pontiac, MI campus? For those interested in studying at the Waterford-Pontiac, MI campus, we invite you to visit us to not only tour our campus but also meet with admissions for a one-on-one career planning session. Will there be people there to help me throughout my program if I need assistance? Yes! Our staff at the Waterford-Pontiac, MI campus is fully committed to helping our students succeed. Throughout your career training program, you’ll have various resources available to you across multiple departments. At any time if you need assistance, please let us know and we’re happy to help any way we can! How long will it take to complete my career training program at the Waterford-Pontiac, MI campus? Each of the programs at the Waterford-Pontiac, MI campus are designed to be completed in just one year! Do your programs offer hands-on training? Yes! Each of the programs offered at the Waterford-Pontiac, MI campus have an emphasis on hands-on training. Students can benefit from traditional classroom instruction as well as hands-on training. Hands-on training can take place in both the labs on campus as well as during the externship (for selected programs), which takes place during the final module of training. Classes start on a regular basis and throughout the year! Please contact one of our admissions representatives today to learn more about when our next class starts. Interested in learning more about the Dorsey Schools Waterford-Pontiac, MI campus? For more information about our graduation rates, the median debt of students who have completed the programs, and other important information, please visit www.dorsey.edu/disclosures. Previous PostWhat’s the Difference Between a Patient Care Tech vs Medical Assistant? Next PostMedical Assistant Jobs | Fact or Fiction?